I need a graphic design to describe payment options. 1b by electronic online payment. 2. 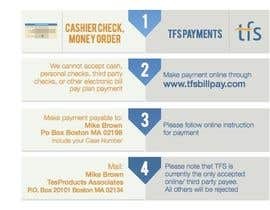 I need a visual color step by step on how to make the payments. Attached file is just a guide for the Text and Content. PLEASE USE YOUR OWN DESIGN, COLORS AND CREATIVITY !!!! The final project file will be submitted with the Photoshop raw file also with a jpg. can you please mention the size/dimensions ..? Can we use illustrator? Or MUST be photoshop?